You wouldn’t think CNBC is the place to deliver a message about the coming socialist political revolution, but Sen. Bernie Sanders cares little about your conventional wisdom. 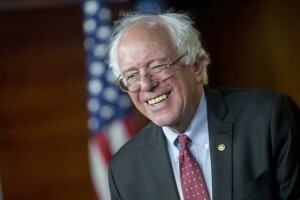 Mr. Sanders, the Vermont independent who launched his presidential campaign last month with a press conference outside the Capitol, is drumming up excitement for a campaign kick-off rally Tuesday afternoon in Burlington, his hometown. In so doing, he told CNBC that its financial industry viewers ought to watch their pocketbooks when he’s president. Mr. Sanders and front-runner Hillary Clinton will be joined in the 2016 Democratic primary field this weekend by former Maryland Gov. Martin O’Malley, who is set to announce his intentions Saturday in Baltimore. But Mr. Sanders is already moving to corner the market on liberal attacks on Mrs. Clinton. Mr. Sanders used the CNBC interview to launch unvarnished attacks on the Clinton family wealth from which other Democrats have so far steered clear. Making $25 million a year – as the Clintons did from paid speeches, according to disclosure reports released earlier this month – insulates them from problems faced by the sort of regular Americans Mrs. Clinton’s campaign says it is focused on, Mr. Sanders said.